MEN'S SILVER RINGS : BRITISH Made : LOVE2HAVE in the UK! 8mm width flat profile wedding ring made from sterling silver with a personalised outer engraving. The BEST! 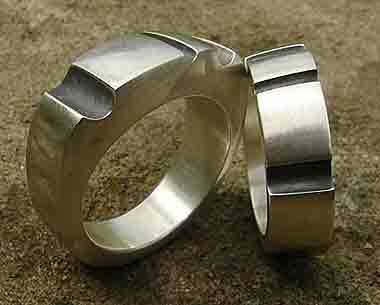 UK made men's silver rings in both unusual and contemporary designer styling. Silver rings for men have become very popular with the modern male and in particular with younger men who will often wear more than one ring at a time on different fingers. Although traditionally many men over the years would have worn wedding rings, not many would have opted to wear dress rings apart from the occasional signet ring or gold coin ring which were popular in the '80s and '90s. Our collection of men's silver rings puts an end to this way of thinking with the onus on modern and alternative designs for men to wear everyday. These days there is a much wider variety of both materials and design styles to suit all tastes and fit within people's budgets. Sterling silver is a fantastic option and men often like oxidised silver rings which come in much more chunky styles. Silver is quite a soft metal, so you need to bear that in mind if you are likely to subject your ring to heavy wear and tear. Our men's silver rings are particularly rugged and up to the job!